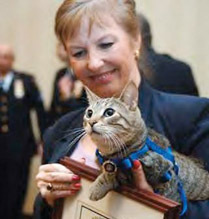 Fred, the crime-fighting cat of the Kings County District Attorney's office who helped put an unlicensed 'traveling' veterinarian away during an undercover sting operation, was run over by a car outside of the home of Kings County Assistant District Attorney Carol Moran, who had adopted Fred from a city shelter. 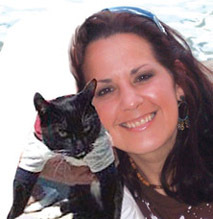 Prior to his death, Fred received his own DA badge and was preparing for a career in the DA's "Legal Lives" program, a classroom-based initiative to teach school children how to care for and treat animals. 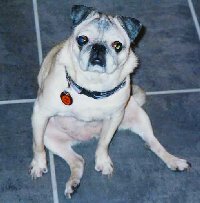 Clarice "The Wonder Pug" was a gentle soul who graced my life for almost 16 years. From howling like a mad dog when I played Bob Marley's "Jammin" to waking up from a coma-like sleep when she heard a pretzel bag opening. In almost 16 years together, we went through divorce, moving a few times, job hirings, job firings, deaths, and life. And the one wonderful constant was always Clarice. Rest in Peace My Sweet. Any donations in her name can be made to Animal Care & Control, NYC at www.nycacc.org. 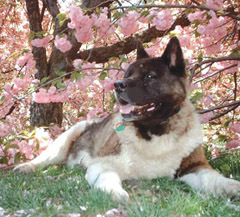 This "Lives Well Lived" memorial page is generously sponsored by Hartsdale Pet Cemetery. 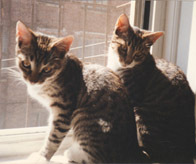 To learn more about Hartsdale Pet Cemetery, visit http://www.petcem.com. 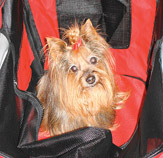 Would you like to be notified when New York Tails updates its Web site with articles about pets and issues of interest to pet owners? Click here to send us e-mail. Enter "New York Tails Updates" as the subject of the e-mail.